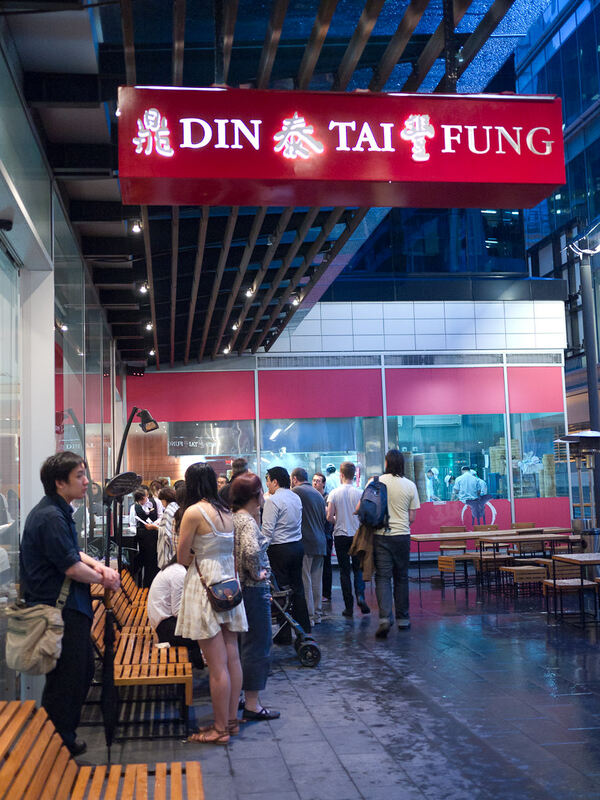 Din Tai Fung is older than me, born as a dumpling stall in Taipei back in 1974. 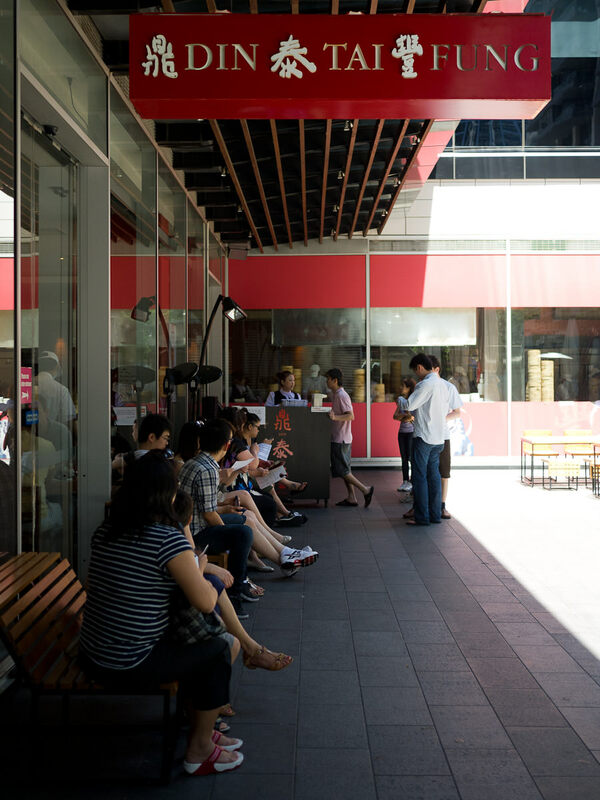 There are now Din Tai Fung restaurants in ten different countries around the world including Australia. 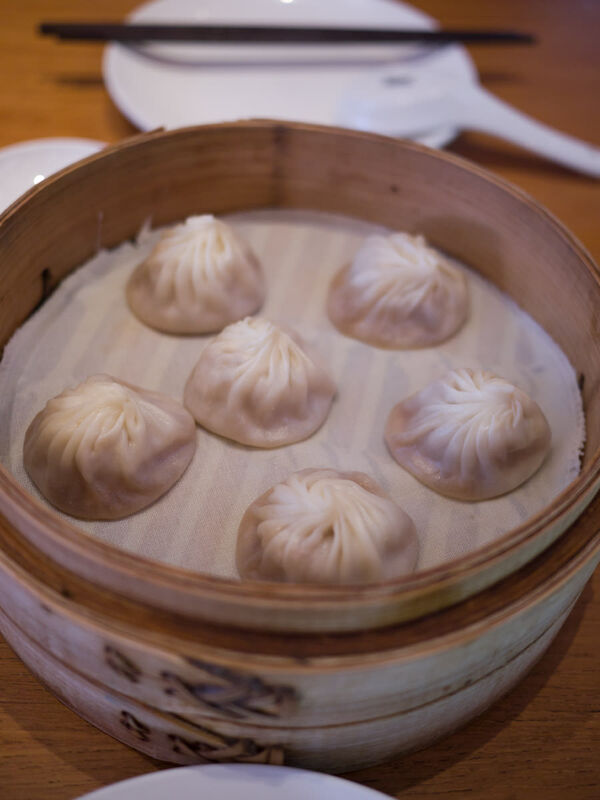 Sydney is home to three Din Tai Fungs and Juji, Jay and I visit the restaurant at World Square not once, but twice on our holiday. Reservations are not taken and there’s usually a queue. 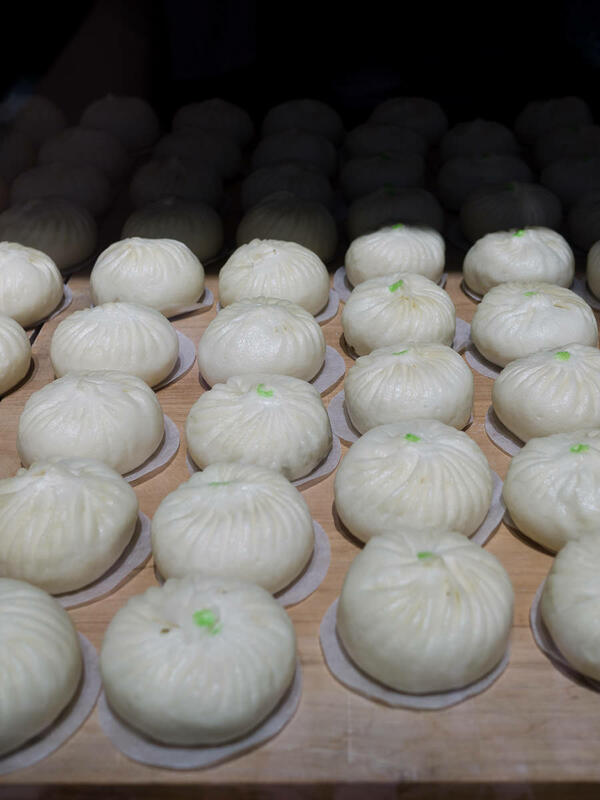 We’re all craving a taste of Din Tai Fung’s legendary soup dumplings – delectable mouthfuls of pork and broth wrapped in hand-rolled pastry, made to order, steamed for precisely three minutes and served in a puff of steam at your table seconds later. When you join the queue, report to the lady in charge. She will ask how many people are in your party and whether you mind sitting at a shared table or not. Your party won’t be seated until you have all arrived and you’ll get a seat much quicker if you agree to a shared table. 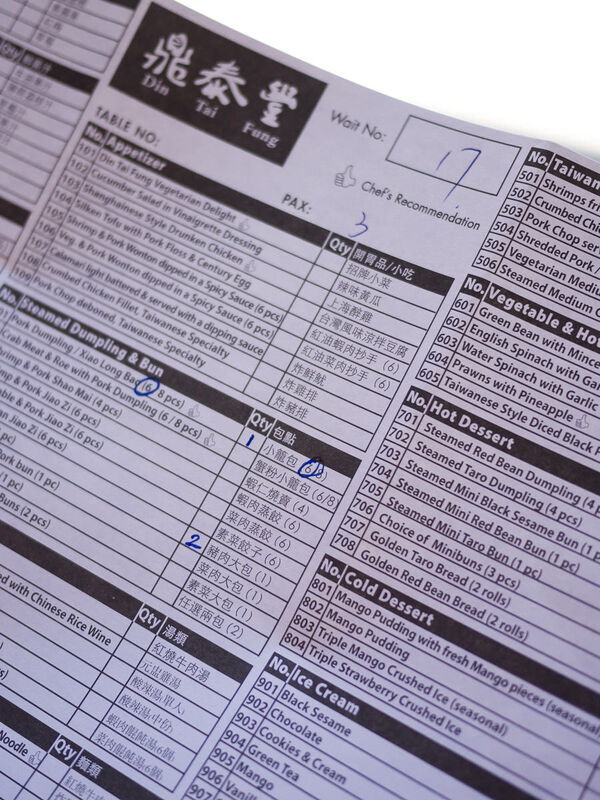 She will also hand you a menu so you can pre-select your dishes ahead of being seated. 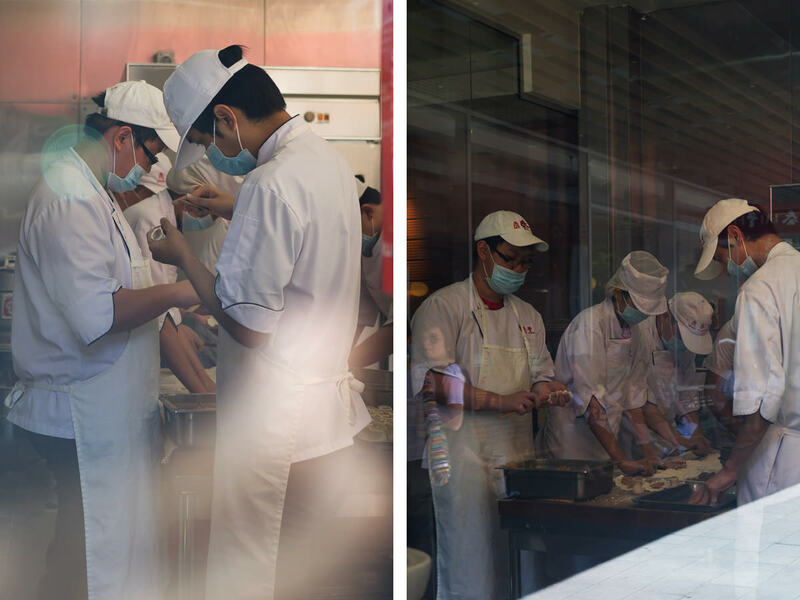 I don’t mind waiting because I can gaze through the window and watch the masked staff deftly making dumplings with nimble fingers and expert hands. 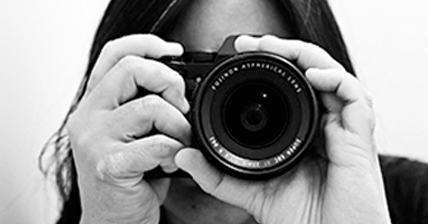 They glance at me briefly as I take photographs but never miss a beat. I also watch dumplings being loaded into bamboo baskets amidst hot clouds of steam. Rows and rows of freshly handmade buns sit ready for orders. Finally, we have a table. The staff see that I am carrying a bag and quickly whip out a place for me to store it. Practical or just adding to the clutter on a busy floor? 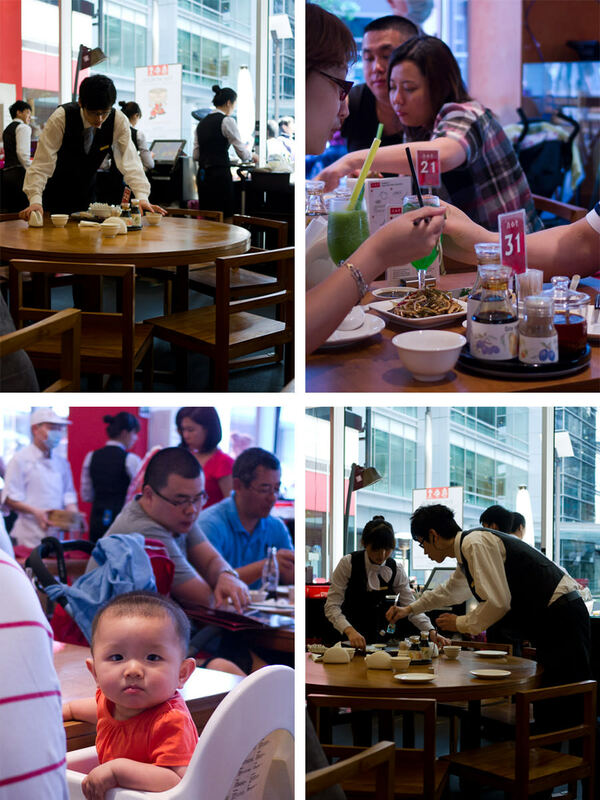 Either way, it’s all part of the experience and spectacle of dining at Din Tai Fung. 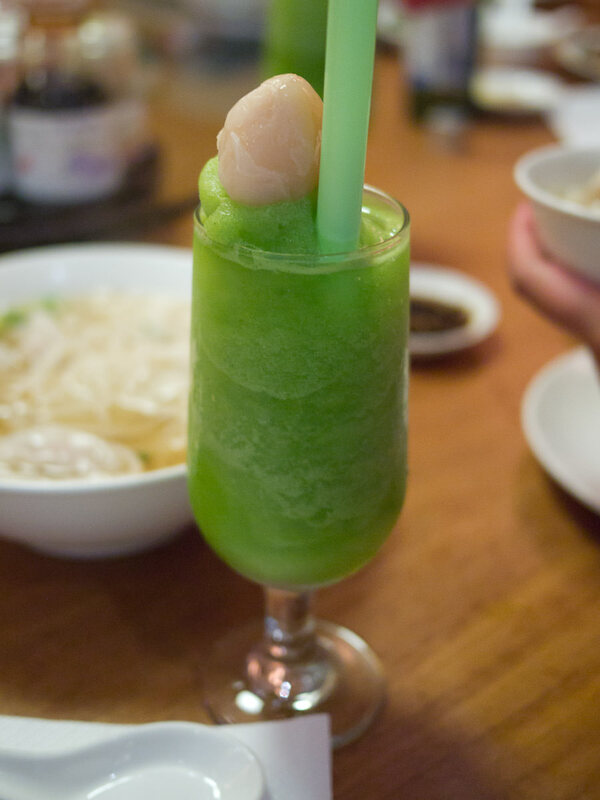 The lychee mint juice is made with sweet juicy lychees, ice and fresh mint blended together to create a slime green slushy that hurts my teeth and brain when I drink it too fast. It looks like it will taste “green” (as in raw and herby) but it’s deliciously sweet and refreshing. But it’s the dumplings we are here for. 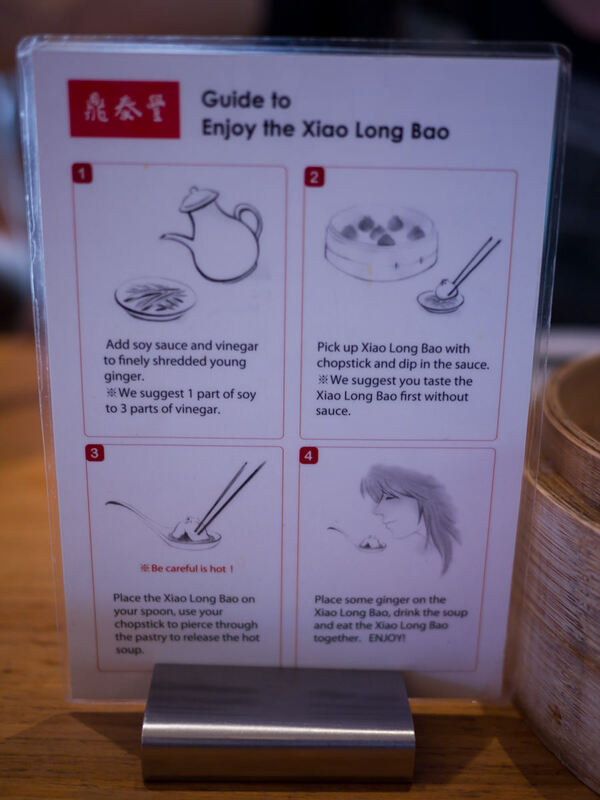 A handy pictorial guide on every table shows diners how to enjoy the famous xiao long bao. 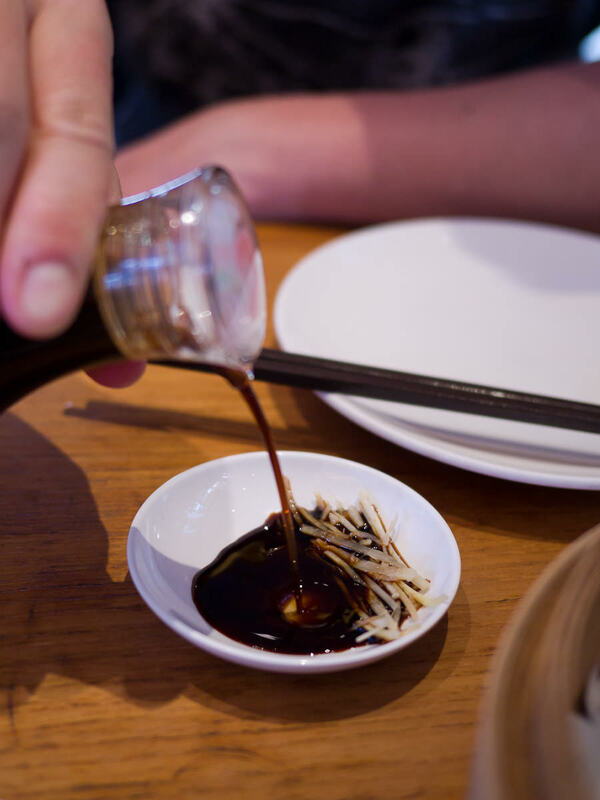 We follow the instructions and prepare our dishes of soy sauce, vinegar and ginger strips in anticipation of the dumplings soon to arrive. Other condiments are available – ground white pepper, and chilli oil for the chilli heroes. 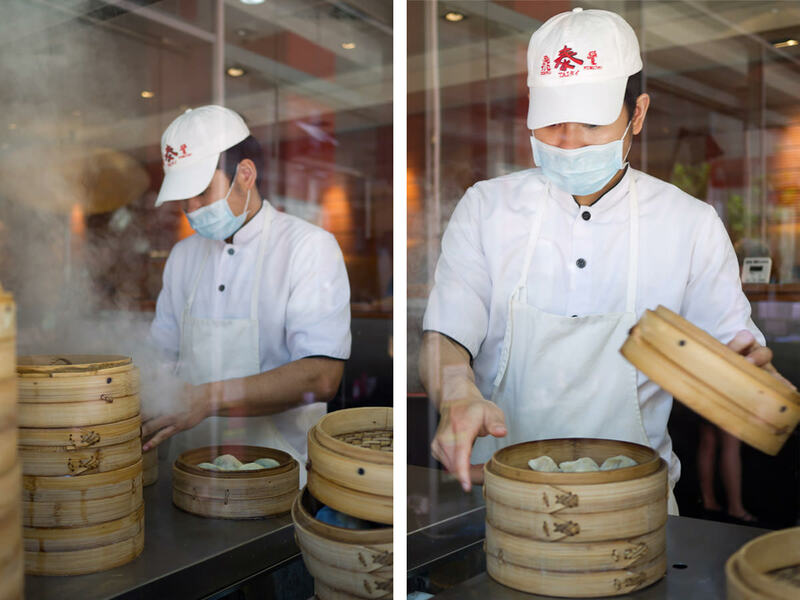 You can order xiao long bao in a steamer basket of six (AU$8.80) or eight dumplings (AU$10.80). These plump beauties are made using wheat flour with delicate yet military precision, the pastry dough shaped by hand and pleated exactly 18 times, each made to weigh between 20.6 and 21.4 grams. 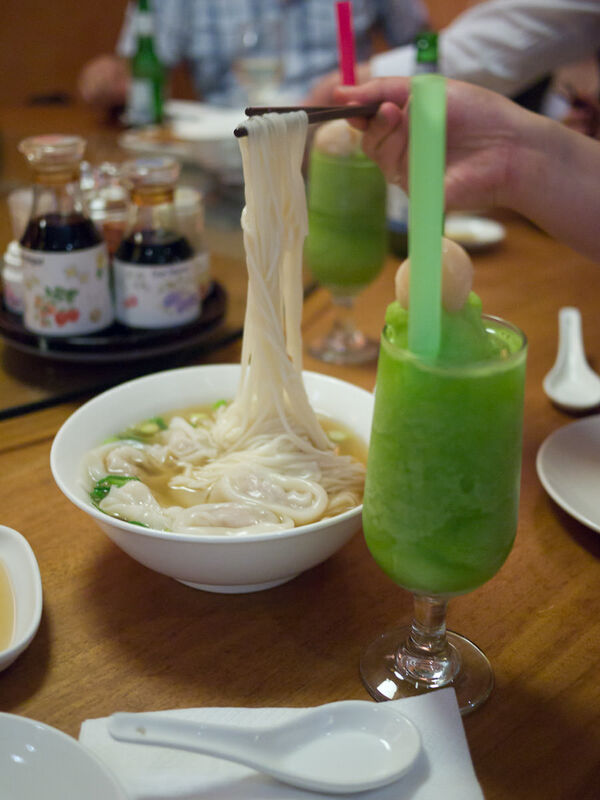 It’s quite tricky to lift a soup dumpling off the cotton-lined basket without bursting it and letting the juice leak out – a gentle, delicate touch is needed to get it out of the bamboo basket and all the way to your spoon. 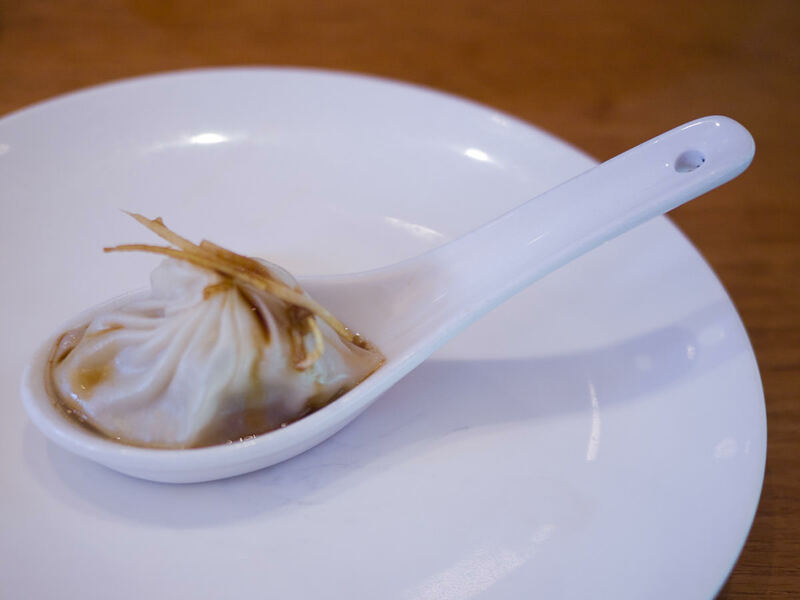 Inside the dumpling is marinated pork mince with a perfect measure of tasty porky broth. We eat the dumplings the recommended way, enjoying the tang of vinegar, the salt of the soy sauce and the bite of shredded fresh ginger. The dumpling skins have just the right amount of spring and chew. Be careful not to burn yourself on the soup! 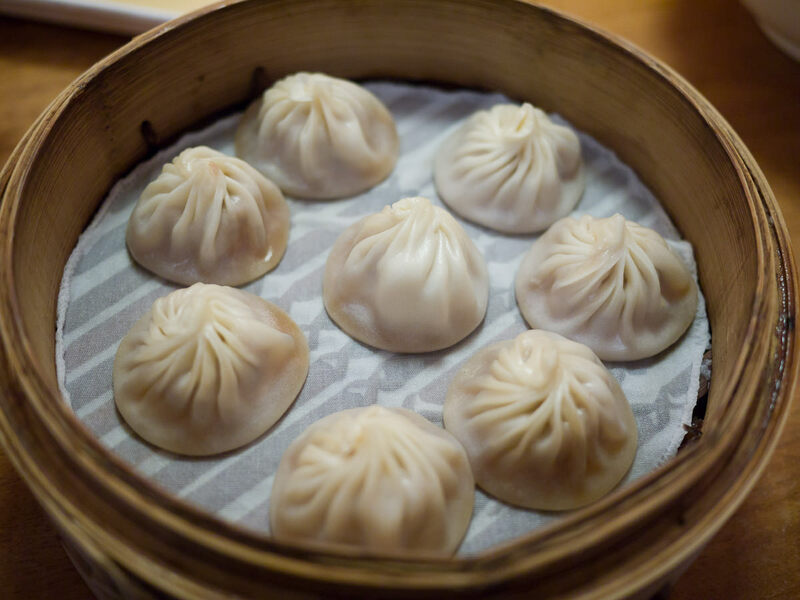 Have any of you suffered mishaps involving soup dumplings? 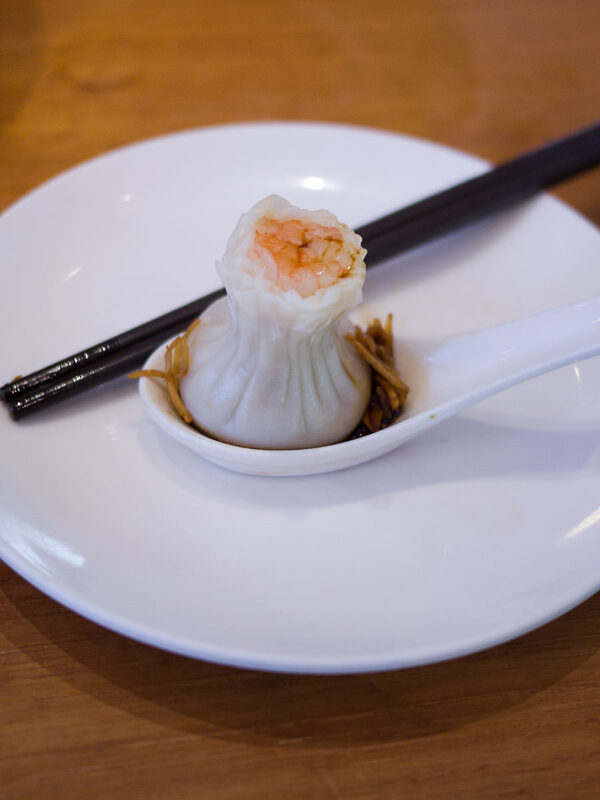 The prawn and pork shao mai look like little money bags, each one topped with a bursty prawn and filled with pork and soup. 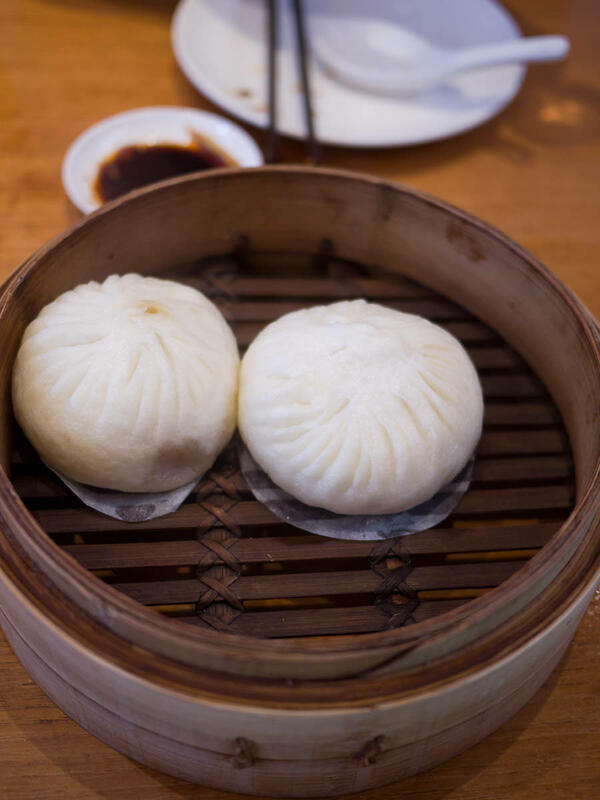 We also order a serving of steamed pork buns with seasoned minced pork wrapped in a fluffy chewy bun. Last, a Taiwanese specialty, fried pork chop. The pork has been pounded tender, seasoned well and coated with a savoury crisp crumb studded with black pepper. 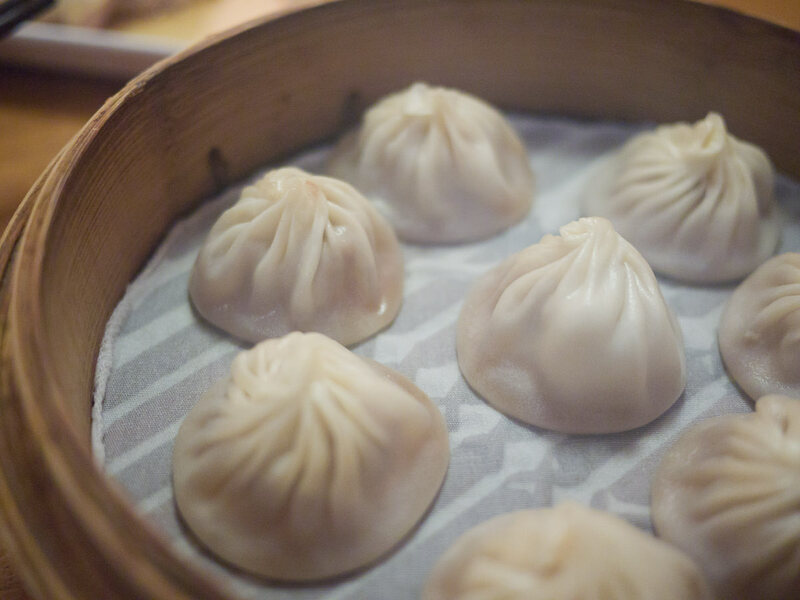 Din Tai Fung is a great place for dumpling and pork lovers, but also those who enjoy people watching. The bustle never stops as tables are cleared, wiped down and reset like clockwork, ready for the next wave of hungry diners who are already waiting in line outside. And for some, dumpling appreciation begins at a tender age. We return for an early dinner a few days later. This time, we say yes to a shared table and get in much more quickly. As it turns out, everyone sitting around our table has eyes only for the food and we feel no awkwardness sharing the table with strangers. 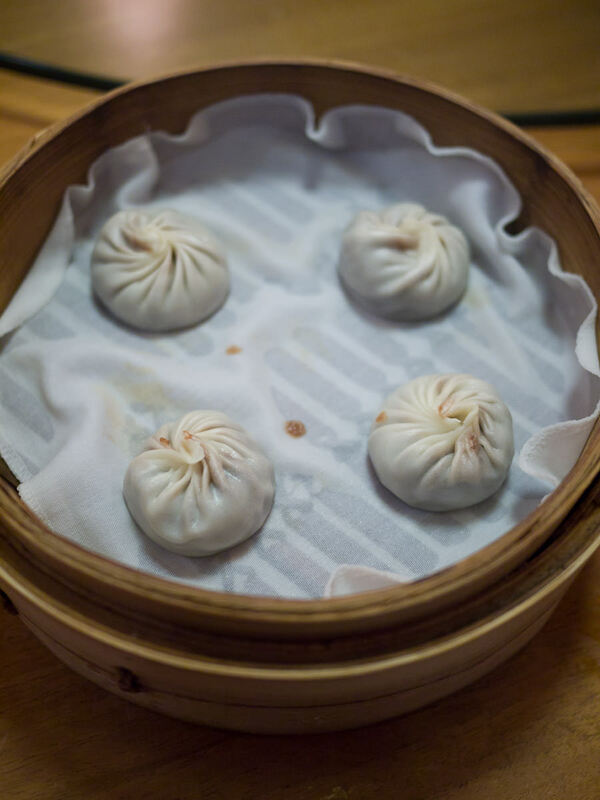 We start again with more xiao long bao. 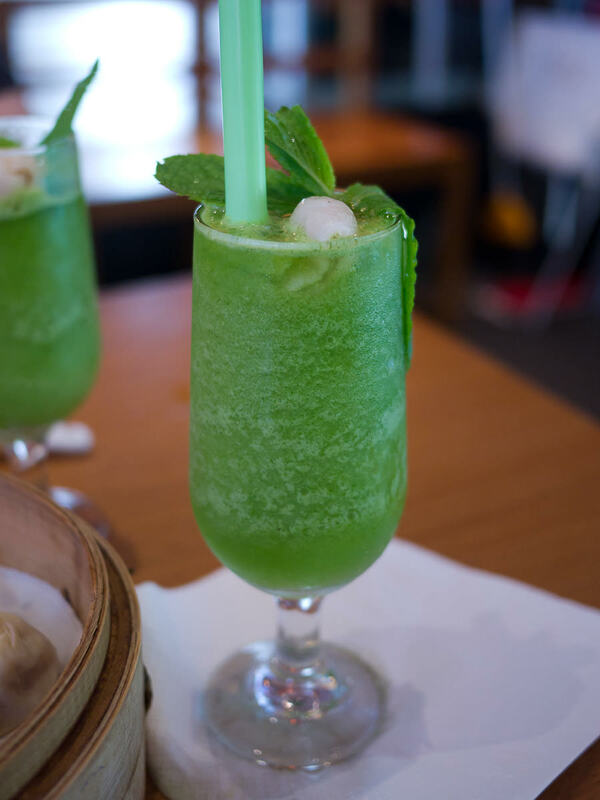 We have fallen in love with those brain-freezing iced lychee mint drinks and order them again. 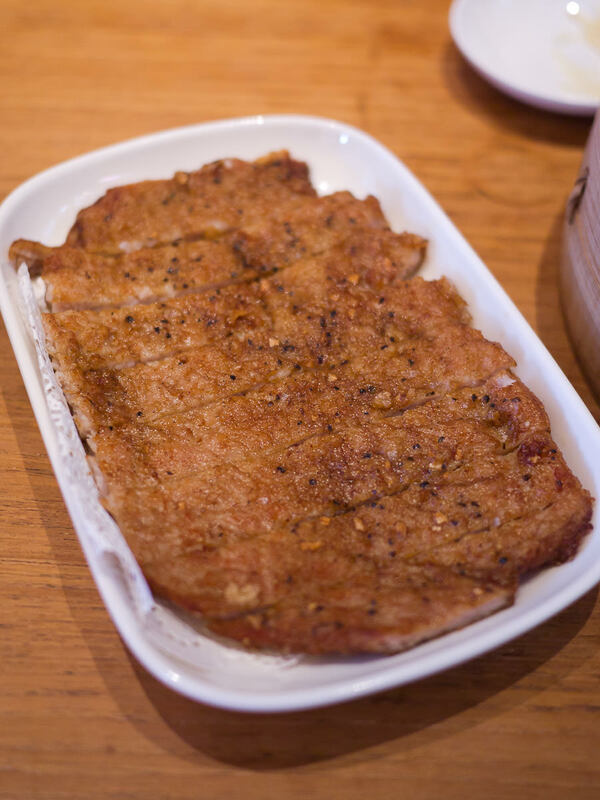 We order Shanghainese style drunken chicken (AU$8.80), succulent strips of deboned chicken with skin on, marinated in Chinese rice wine and served cold. 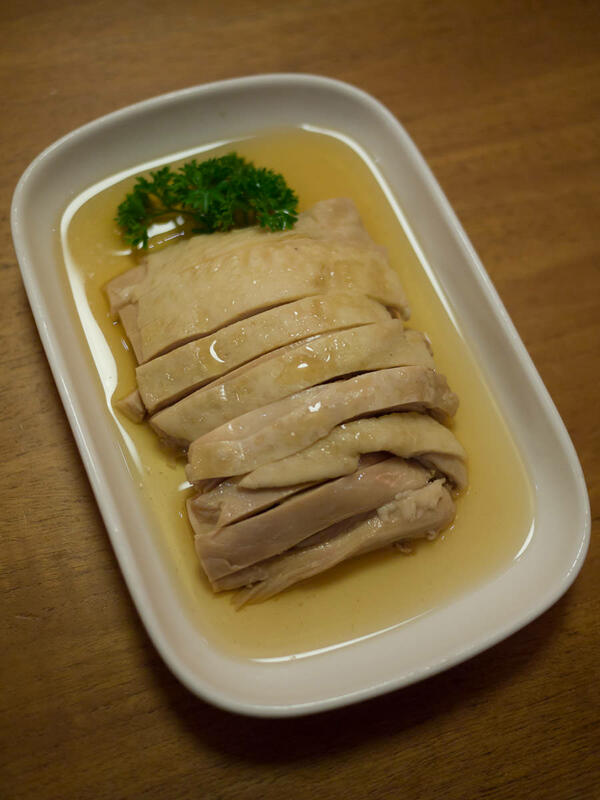 The chicken is exquisitely tender, moist and silky smooth. 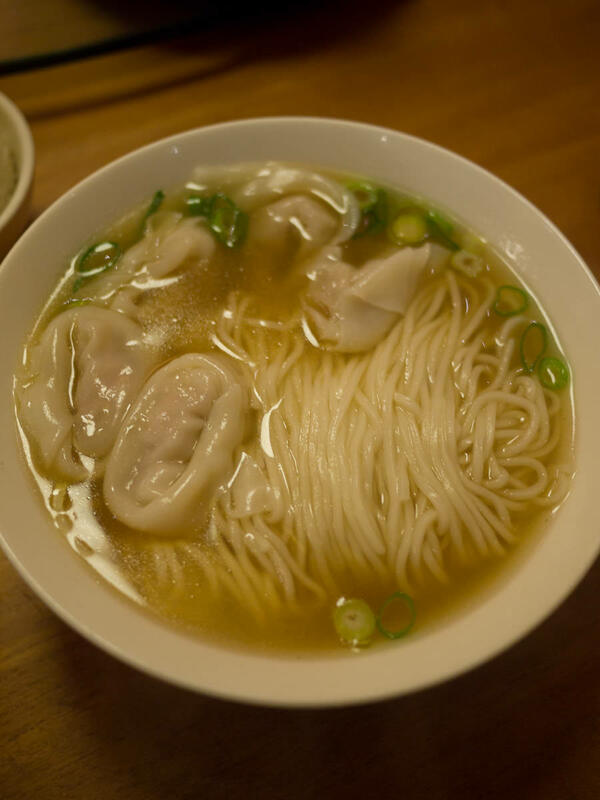 We share a bowl of shrimp and pork wonton noodle soup (AU$12.80), with hand-pulled noodles and dumplings in a savoury broth. 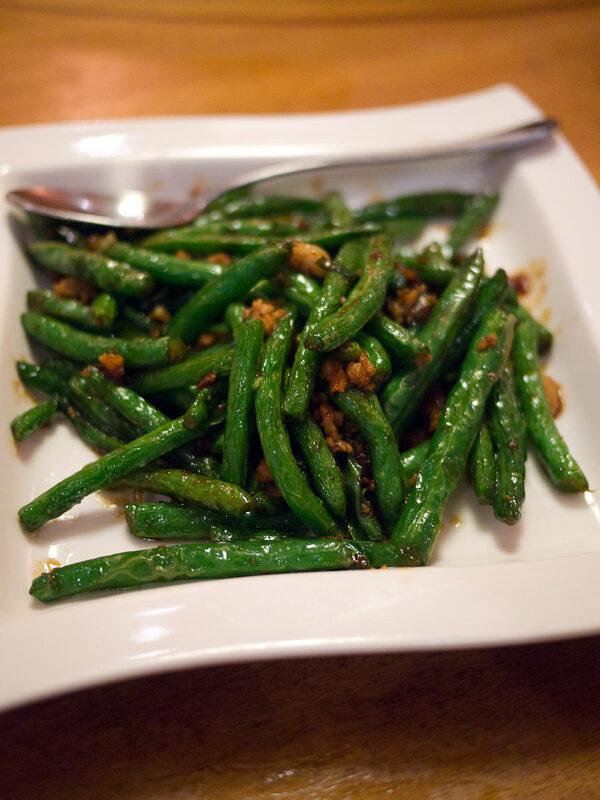 Other than the xiao long bao, the dish on just about everyone’s table is the green beans wok fried with minced pork and dried shrimp (AU$12.80). This strongly flavoured toothsome bean dish is one of my favourites of the entire Sydney trip. 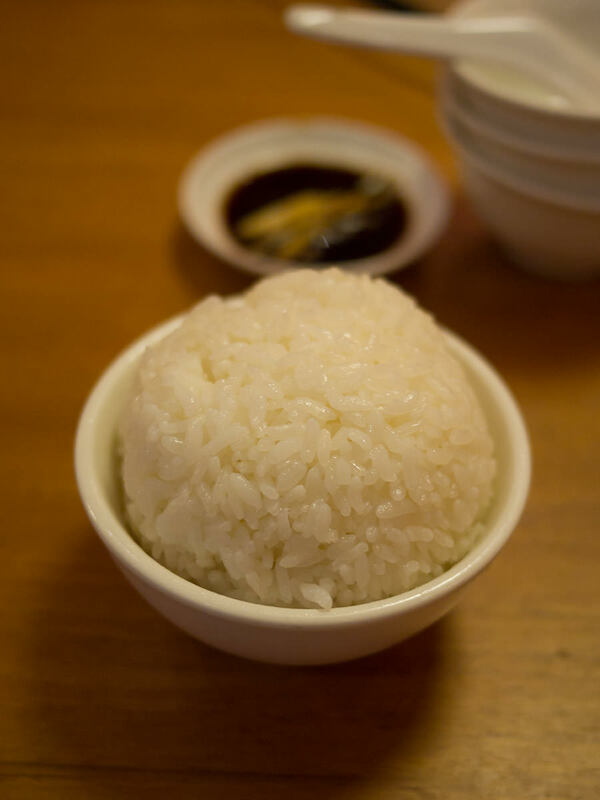 We order steamed medium grain rice (AU$2.00) to eat with the chicken and green bean dishes. We end our meal on a sweet note, with steamed red bean dumplings made to order (AU$5.80), filled with fudgy-textured red bean paste. It’s been another wonderful meal and although my belly is full, I almost feel reluctant to leave. 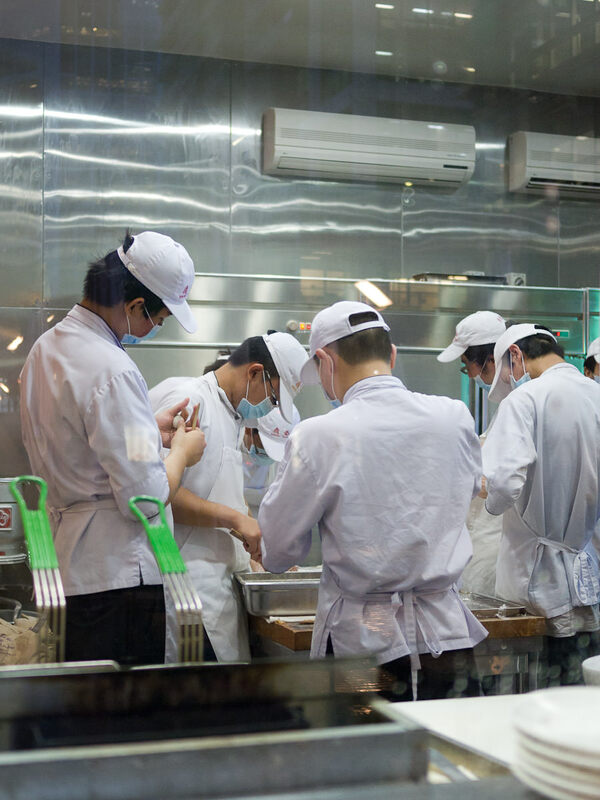 I can’t help taking a last look at the dumpling makers still pumping out the dumplings in the glassed-in kitchen. And the queue outside is as long as ever. 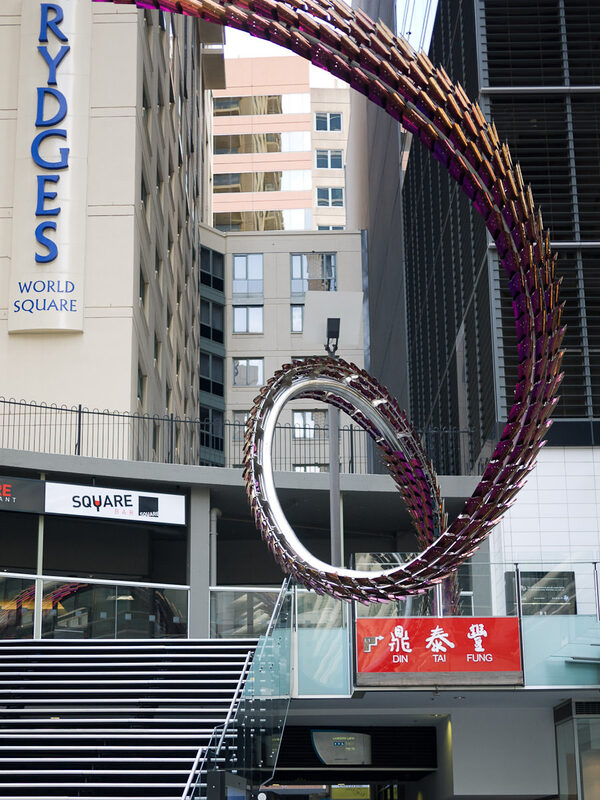 To get to Din Tai Fung at World Square, go upstairs past the metallic sculpture (it makes me think of a scaly dragon’s tail). 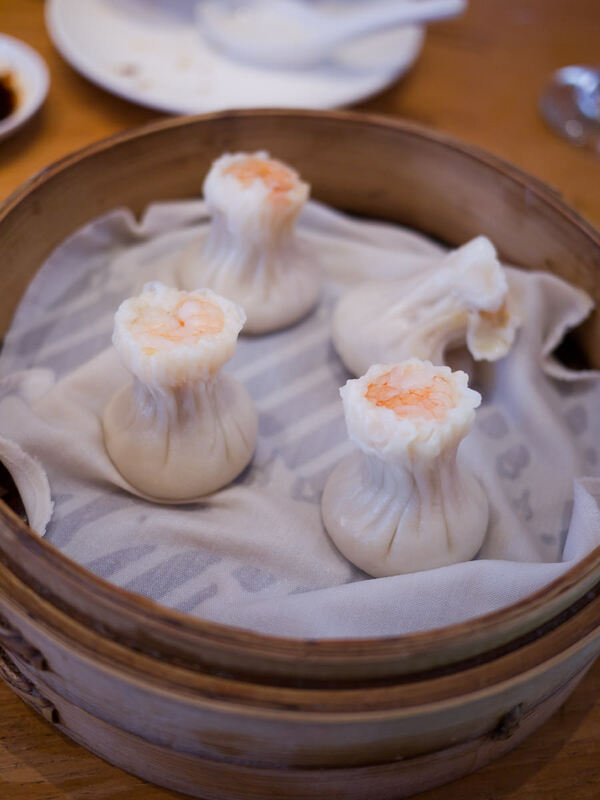 Some say Din Tai Fung is overpriced and there are plenty of other places to get great dumplings in Sydney (happy to get your recommendations), but we really enjoyed ourselves and I wish we had a Din Tai Fung in Perth. 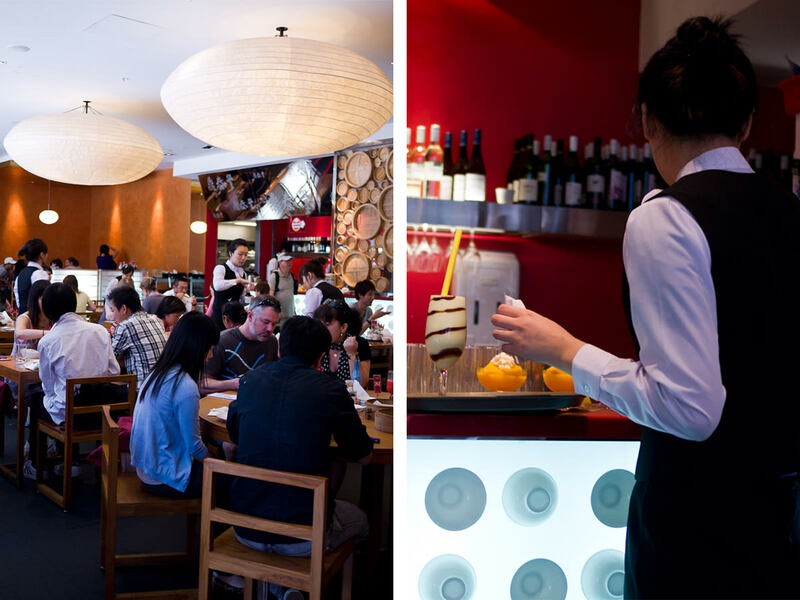 If you’re a Din Tai Fung fan, what are your favourite items to order? I went to Sydney with my sister Juji and her fiancé Jay in November 2011. See the list of Sydney posts so far, in reading order. There’s a whole lot more to come. We’ve been overwhelmed by your kind words during Billy Lee’s time in hospital and since her passing. 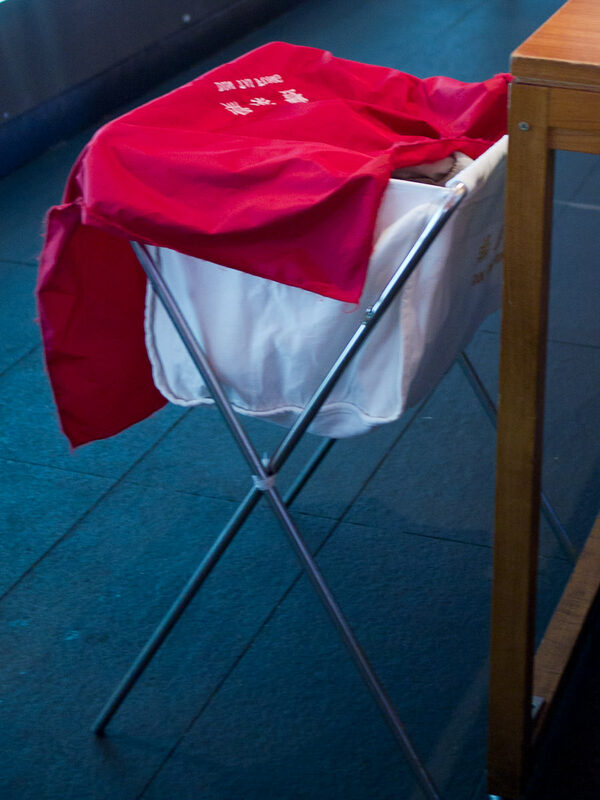 A couple of staff members who looked after Billy Lee in Emergency and the ICU have also passed on their condolences. Thank you all, it means a lot to us.